“Barkcloth” takes on a whole new meaning when you involve actual trees, specifically the Mutaba (Ficus natalensis) in Uganda. It’s this arboreal textile that makes up Refinity’s roughhewn, leather-like trench coat, which fastens shut—sans buttons—with the Dutch design consultancy’s click/fold system. Barkcloth, like leather, is durable and does not fray, yet it doesn’t require the same chemical-intensive tanning. The bark is stripped without damaging the tree, pounded with grooved mallets, then “cooked” into malleable fiber using solar-reflecting mirrors. It’s a centuries-old technique, one that is recognized by UNESCO as a Masterpiece of the Oral and Intangible Heritage of Humanity. Barkcloth is durable like leather, yet it doesn’t require the same chemical-intensive tanning. 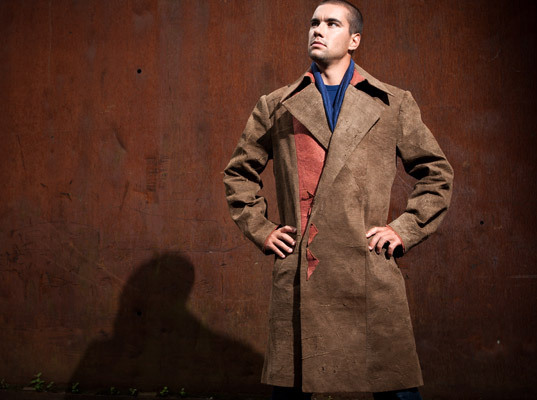 The resultant trench coat’s dark and muted hue happens to be forgiving on dirt, stains, and infrequent laundering—another ecological plus. Conferring an element of multifunctionality is the underlying blue vest, made with local German linen, that can be used in tandem with the jacket or worn independently. "Barkcloth" takes on a whole new meaning when you involve actual trees, specifically the Mutaba (Ficus natalensis) in Uganda. It's this arboreal textile that makes up Refinity's roughhewn, leather-like trench coat, which fastens shut�sans buttons�with the Dutch design consultancy's click/fold system. Barkcloth, like leather, is durable and does not fray, yet it doesn't require the same chemical-intensive tanning.